Marine navigation lights tend to perish quickly due to the fact that they are exposed to the elements throughout the year, and as such, bulbs and cable deteriorate leaving you without lights when most needed. With some simple maintenance, correct seals, cable routing and new LED lights these problems can be resolved, giving a reliable marine lighting system through all seasons. 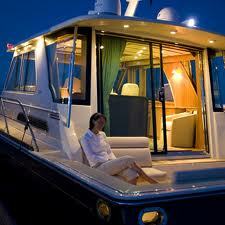 Interior and decorative lighting can add to the aesthetic appeal of a boat as well increasing safety onboard. PSI marine electricians can supply and install cabin ceiling and wall mounted lights designed to enhance the appearance inside a boat. Our marine electricians are also skilled at designing and building bespoke LED lighting systems to give that extra special look to cabins, saloon and deck areas. We offer a range of external deck and transom lights that, not only improve the level of safety, while travelling in poor light conditions, but will also add to the aesthetics of the boat.